﻿To get the best value out of your Tasmanian mountain bike adventure, you may like to take up our Mates Rates membership, giving you a minimum 5% OFF your non on-sale purchases with participating businesses. 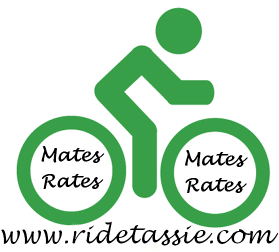 Look for the MTB Mates Rates icon when shopping for products & services both on this website and in the businesses you visit when in Tasmania. Please Note - when making your Tassie accommodation and travel bookings, ask them if they offer Mates Rates discounts and if not, why not !